"During the reign of the Emperor Theophilus, the city of Constantinople was visited by earthquakes for almost four months. The Emperor, the Patriarch Proclus [who is actually St. Proclus, the disciple of St. John Chrysostom, whose feast is celebrated on November 20th], and the people joined in a barefoot procession to make prayer to God for their safety. While they were gathered, the tremors increased dramatically, and a young boy was taken up into the sky in the sight of the people, who fearfully cried out Kyrie eleison! When the boy came down from the heavens, he said that he had been among choirs of Angels who sang Holy God, Holy Mighty, Holy Immortal, have mercy on us! and that a voice had commanded him to tell the Patriarch that the people should make supplication to God in this way. The Patriarch instructed the people to chant this hymn, whereupon the ground stopped shaking and the child died. 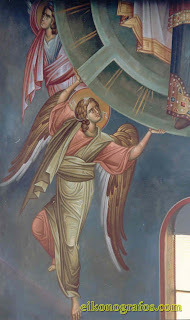 The Empress Pulcheria (September 10) asked the Patriarch to order that this hymn be chanted henceforth in the Divine Liturgy, as it still is today."